There are two Alex Camerons. In real life, he’s a 30-year-old musician from Sydney, Australia; he’s thoughtful and mild-mannered, with a casual charisma that’s both movie-star cool and boy-next-door affable. 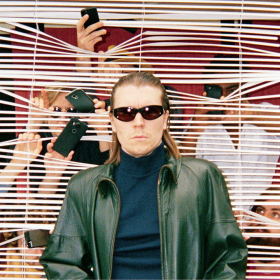 Then there’s another Alex Cameron, the artistic construct that creeps and croons across his first two albums, Jumping the Shark and Forced Witness. In his music, which some critics have described as “sleaze pop,” Cameron switches between the perspective of an earnest pop-singer with wry lyrics, and a cast of depraved characters that reflect our internet-addled society’s worst impulses. On October 11, all of these iterations of Cameron will take the stage at Warsaw in Brooklyn, a concert venue tucked inside the Polish National Home. As the legend goes, Cameron adopted the persona of a failed performer early in his solo career, wearing heavy makeup and prosthetic scars to realize the look. You get a taste for the aesthetic as you look at the cover art for Jumping the Shark, which features the type of lecherous, hip-thrown lounge singer you might imagine leering at you in a smoky room. 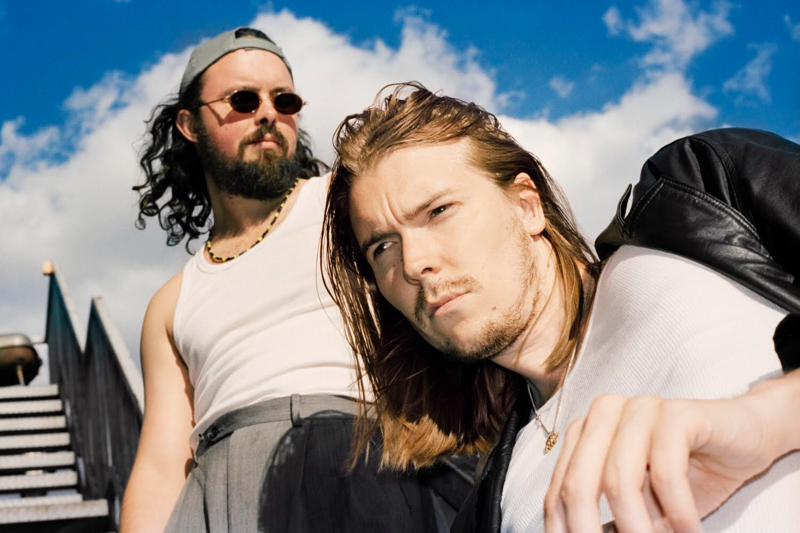 On the album, Cameron tells tragicomic tales of seedy characters, the type that exist in the real-life, but are largely ignored in the mainstream. In “Happy Ending,” the album’s leading track, we hear the story of a failed banker trying to find redemption in Chinatown. “I’ve been missing you, baby/Let’s go to Chinatown/That’s where we’ll find our happy ending,” he sings. According to Cameron, the album is about the intersection between ambition and ability, and how self-belief can sometimes lead us toward failure. 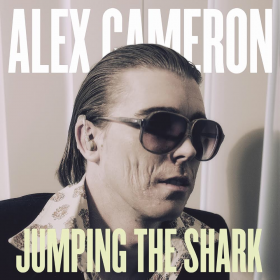 Cameron on the cover of his debut album, Jumping the Shark. On Forced Witness, his second album, the pop influence is more overt, though loathsome figures still take center stage. Consider “Studmuffin96,” in which a middle-aged man deludedly (and pathetically) waits for a minor to reach the age of consent. “I’m waiting for my lover/She’s just gotta be eighteen/I’m waiting undercover/I’m kneeling at her feet,” he sings. Cameron got inspiration for the album from his time working at the Ombudsman’s Office in Australia, where he would have to sort through cases of misconduct filed by citizens against the police. He tried to channel the public’s indignation, writing from the perspective of someone who’s been unjustly treated. “It’s a little like how I would get if was being very passionate, maybe a little loose, maybe a couple drinks under my belt,” said Cameron of his lyrical style. “I’m feeling loose and conversational, a little bit soap boxy. It’s how people talk when they’re pushed to their limits emotionally.” In its totality, Cameron’s music is a dark yet amusing anti-social commentary. The cover art for Cameron’s second album, Forced Witness. Since officially signing with his label, Secretly Canadian, in 2016, Cameron’s star has risen considerably. Over the last couple years, he’s performed and collaborated with Brandon Flowers, frontman of The Killers; worked with producer extraordinaire Jonathan Rado; and generally established himself as a critical darling on the indie circuit. These days, he’s living in a surfer shack with his saxophonist and “business partner,” Roy Molloy, and things are going so well, they can even afford to pay rent, albeit on a month-to-month basis. In Cameron’s current act, the one that will play at Warsaw, he’s ditched the powder and scars, creating a more vivid divide between the depravity that haunts his music and the golden-haired man from down under. At 6’4” Cameron cuts a slim and attractive figure on stage, at once lithe and virile, often wearing a tank top underneath a cheap-looking suit. His saxist and roomie, Molloy, provides a shorter, brawnier foil. Their physical differences combined with a lifelong friendship – they grew up together in Bondi Beach – makes them an endearing duo, worthy, it seems, of their own television show. As Cameron sunk deeper into his chair, telling me about his childhood, Molloy sipped coffee nearby in the kitchen and added to the conversation. Back in Australia, in high school, Cameron was a pretty good basketball player. He had the height, it was just a matter of filling out. But he was never all that convinced of his abilities. But with music, it was the total opposite. Cameron could visualize himself being successful on stage. As early as five years old, he spent entire days imagining concerts in front of two, three hundred people in an assembly hall. There was “a stage with curtains, a wooden stage, elevated three or four feet. Brick walls. Probably a bit like Warsaw,” he remembered. On Oct. 11, along with Molloy, Cameron will be accompanied by Holiday Sidewinder, a keyboardist based in Los Angeles; Henri Lindström, a Finnish drummer; Justin Nijssen, an electric guitarist; and Madeline McCormick, who’ll be playing the bass guitar. Expect the show to last about 70 minutes; according to Cameron, that’s where the entertainment value peaks. This won’t be Cameron’s first show at Warsaw. In 2016, he played there with Molloy as a two-piece supporting act. It was a fun show – they specifically remember a “strong vibe” and the serving of pierogis – though the duo performed facing considerable adversity. “Last time we were there was the absolutely most hungover I’ve ever played,” said Molloy. “Rancid. It was too much drinking the night before,” said Cameron, sounding a bit regretful.